Flora Duffy is cutting out all the distractions ahead of her biggest moment on the world stage on Saturday. The Bermudian has a legitimate shot of making the podium in the Rio Olympic women’s triathlon at 11am tomorrow. Local residents are likely to catch at least snippets of the race live on TV, but they can watch it in its entirety without commentary if they download the Bermuda Broadcasting Rio 2016 app, available in both the Apple and Google Play stores. Duffy — who has a string of international wins — is widely considered a medal contender at these Games, with USA Today predicting Duffy will win the silver while Sports Illustrated has her down for the bronze. 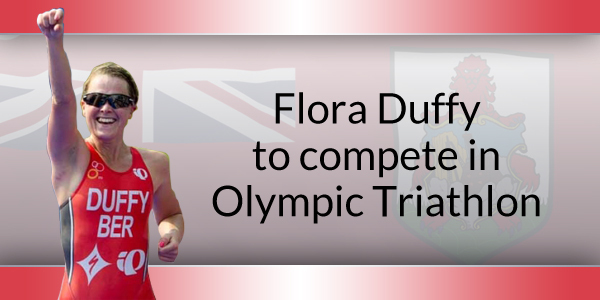 Triathlon Magazine issued their predictions yesterday, and while they predict Duffy could well be leading after the bike, they are saying stronger runners will pass her and keep the Bermudian off the podium. Most odds makers have her from 6-1 to 8-1 win the gold medal with her being 4.5-1 to win any medal. Duffy is currently the number one ranked woman in the world in triathlon. Bermuda — which is the smallest nation in the world to hold an Olympic medal due to Clarence Hill’s 1976 bronze in boxing — has a legitimate shot to double that total. 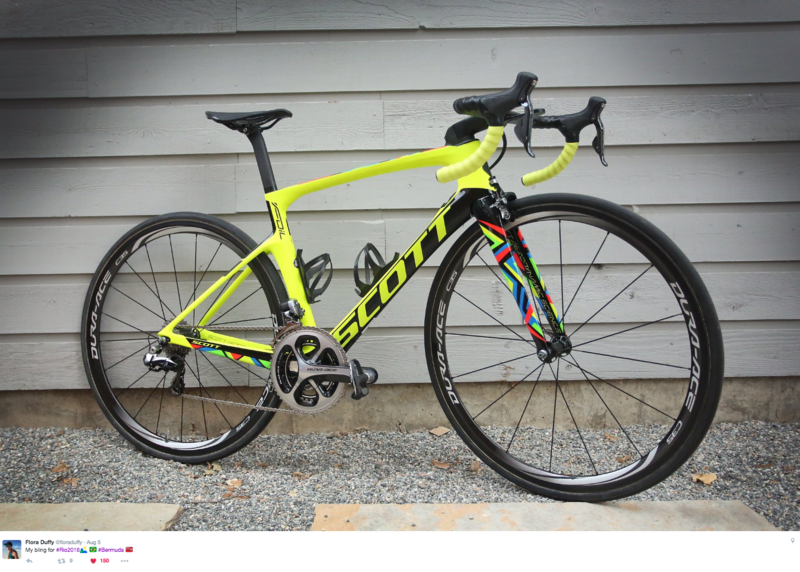 Duffy had her specialized bike “blinged” with the Rio Olympic colours for Saturday’s triathlon. If you had asked triathlon experts a year ago, it is likely none of them would have listed Duffy as a medal favourite for the Olympics. An article in Lava magazine illustrates this, saying “A year or so ago, she was an outlier. A risk-taking cyclist who was often eaten up on the run. At the Bejing Olympic Games, Bermuda’s Flora Duffy was a DNF. In London she finished a dismal 45th, a few spots back of some American named “Jorgensen” in 38th and some Swiss girl named “Ryf” in 40th. “Flora Duffy is pack fill no longer. And certainly not this year. As if a veil had been lifted, Duffy—the reigning XTERRA World Champ and a bike specialist in the mold of the great Craig Walton—swims front back, then at her choosing, takes off on the bike. In the past, some from the bike pack would reel her in on the run. Lately, however, Duffy’s run has improved, increasing her chances of staying away to the finish. “This summer has been a windfall. While she’s come close to victory last year and finished 11th at the Rio test event last August, this year she’s broken through, in stepladder fashion; fourth at WTC Abu Dhabi and Gold Coast. Third at WTS Cape Town. Second at WTS Leeds. Then finally, her first WTS win at Stockholm. She polished that off with a victory this weekend at the ITU’s World Cup stop in Montreal. “If you wanted to write a textbook on how to peak for an apex event like the Olympics, there it is. So the question becomes not if Duffy can go top 15, or even top 5. It’s become “what color hardware can she bring home for Bermuda?” the Lava report added. So on Saturday morning, the eyes of Bermuda will be on her. Packed sports bars will pry their gaze away from English football; mom and dads with sit in front of the TV with their children hoping that Duffy can make it on the podium and stand there with a medal around her neck. Regardless of the outcome, Bermuda will be proud that one of our own more than held place amongst the world’s elite. Lots of competition for the medals. Fl..uffy, it’s just another race. Believe in yourself, believe that you can get it. We know there are some tough competitors out there ..the American, some British and others…Guess what they are all thinking…there is tough competition out there, the Bermudian. Show them why they are right to admire you. Have a great race…we are all very proud of you. You make us proud. No matter what happens. Best of luck and we are all rooting for you!